Defense lawyers for an Army staff sergeant accused of killing his wife and a police officer on her first shift pleaded with a jury to convict their client on a charge other than capital murder. 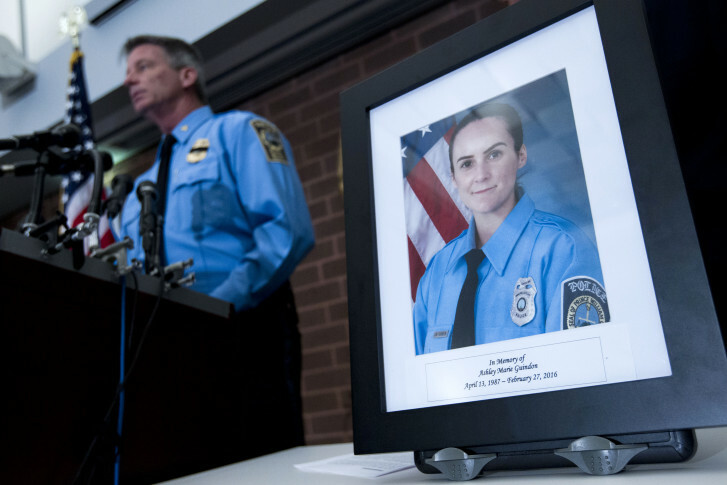 MANASSAS, Va. (AP) — Defense lawyers for an Army staff sergeant accused of killing his wife and a police officer on her first shift pleaded with a jury to convict their client on a charge other than capital murder. A jury heard closing arguments Tuesday in the death penalty trial of Ronald Hamilton, 34, of Woodbridge, Virginia, who is charged with capital murder and other counts in the February 2016 fatal shootings of his wife, Crystal Hamilton, and Officer Ashley Guindon. He is also charged with attempted capital murder of two police officers who survived the shooting, Jesse Hempen and David McKeown. Prosecutors said Ronald Hamilton shot his wife four times with a Glock handgun. Several officers responded to the 911 call. The officers tried to enter the house to check on Crystal Hamilton’s welfare, but Ronald Hamilton refused to let them in. One of the officers then kicked open the front door, only to find Hamilton crouched with an AK-47 rifle opening fire. All three officers who initially responded to the home were struck, including Guindon, who had just been sworn in as an officer. Hempen and McKeown, who testified at the trial, survived but suffered serious injuries. Gene Hart, one of Hamilton’s public defenders, acknowledged to the jury during Tuesday’s closing arguments that Hamilton is guilty of the slayings. But, he argued that the killings lacked the premeditation necessary for a capital-murder conviction and possible death penalty. Instead, he urged the jury to convict on lesser charges of either second-degree murder or voluntary manslaughter, saying Hamilton was acting in the heat of passion. “The government has to prove to you — what was Ronald Hamilton’s intent? What were his thoughts? It is getting inside the mind of the defendant,” Hart said. Prosecutor Richard Conway said the most obvious evidence of premeditation is the fact that Hamilton selected a Glock handgun to shoot his wife, and then upgraded to a more powerful AK-47 rifle in preparation for the anticipated police response. “A .45 Glock, that’s just not going to do it when the police arrive,” Conway said. While prosecutors presented an overwhelming amount of evidence, they were hamstrung by a ruling that barred them from presenting expert testimony such as DNA and ballistics evidence or the conclusions of the medical examiner’s report. The judge barred the testimony after prosecutors missed a deadline requiring advance notice to the defense of such experts. Hart sought to capitalize on that during closing arguments, noting the lack of DNA and fingerprint evidence and suggesting that prosecutors should have been more thorough in a potential death-penalty case. “The failure to provide readily available evidence is just startling,” Hart said. If convicted of capital murder, prosecutors will seek the death penalty during the trial’s sentencing phase. A sentencing phase would likely involve several weeks of testimony, and jurors would choose one of two options: execution or life in prison.